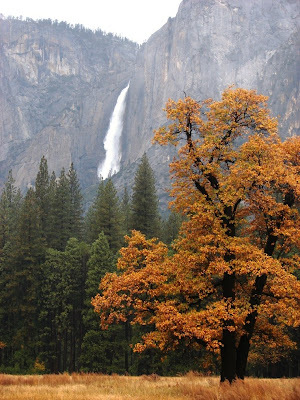 One more picture from last Saturday, and a look at the anatomy of a fall flood event in Yosemite Valley. I doubt any damage was done, since the high flow was average for a normal spring runoff day in April. But not for November! The river went from around 20 cubic feet per second to a record 1,160 cfs in a matter of hours as a result of a warm storm. The previous record was around 650 cfs for the date. The rushing waters were dark with mud and dirt that had accumulated in the riverbeds for the last six months or so of no rain and low river flows. A cleansing was taking place. I realize this will be a clumsy analogy, but I am hoping that this day, November 4, will be an unexpected flood of a different kind. I blog because I love geology and I want to share my stories and my pictures with whoever finds them interesting. But I learned blogging from politics...I am a political junkie at heart, and for years I waited for news from newspapers (in the really olden days), and from 24 hour cable news (in the somewhat less olden days), and from the internet over the last couple of years. For months now, I have haunted the internet "tubes" for every tidbit of evidence that the political winds in my country are finally changing. And I feel like a storm is coming, one that will cleanse this country of the filth that has accumulated over the last eight years. How is it that a country that stands for freedom and justice and equality ended up in an unjustified and tragic war of choice that has killed more than 4,000 of our best? How did we end up as a country that imprisons people without due process, and which condones torture? When did we tear up our own constitution? I have been waiting for my country to wake up and repudiate those who have subverted justice and law to their own ends. There is hope, in that the current occupant of the White House has the lowest approval ratings in polls ever recorded. There is hope that the Senate and House fell into the hands of a different party in 2006, even though they haven't accomplished much in these two years. But most of all I find hope that a good man named Barack Obama stands at the threshold of being elected president. He has been the target of one of the slimiest and most negative political campaigns ever conducted in American history, and has fought back with grace and leadership. I would never have thought a moment in history like this was possible. But maybe, maybe this day it will happen. I hope for a landslide, a flood, a tsunami, to wash away the stains that Bush and Cheney have left on our reputation as a country of justice and law. Be sure to vote today. If they try to stop you with long lines, with too few voting machines, or electronic machines that don't accurately record your choices, fight for your right to have your vote counted. Don't be intimidated. Voting is a right that many have died for, and this day no one can deny you. Booo-yahhh! Well put, and a nice geometaphor! I have spent way too little time on science and way too much time on politics on my blog, but the latter has become almost an obsession with me over the last 6-7 years. Just as a major earthquake wakes people up to the relevance of geology, so have the last 8 years awakened me up to the relevance of politics. Last night I saw a glimmer of hope that the nightmare of the last eight years is staring to fade away. We have enormous problems to solve ahead of but I believe that Obama truly wants to inspire all of us to be a part of the solution. This self-destructive and divisive atmosphere we have had this past decade has to be healed or our future could be at grave risk. The ecological and social crisis we face will take much cooperation and ingenuity. We needed someone like Obama who I feel can inspire all that is good and noble about us.